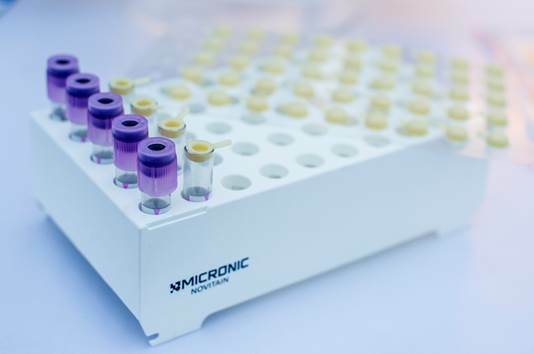 Micronic offers the unique Novitain™ Capping Solution to ensure sample integrity during the short-term storage of sample collection tubes. Designed in conjunction with healthcare professionals, the solution consists of the Novitain TPE Capcluster-50, the 50-well format Novitain Storage Rack and the Manual Capper CV750. In medical laboratories analytical tests are usually conducted on blood and urine samples in order to obtain information about the health of a patient. These analyses are very important diagnostic tools to clinicians testing for evidence of infection, disease or abnormalities. Typically the samples are collected in vacuum tubes before being sent to a medical laboratory for testing. After analytical tests, the vacuum tubes need to be securely stored for several days in case additional testing needs to be done. The Novitain TPE Push Caps offer an ideal solution for safe short-term sealing of sample collection tubes stored in a 50-well format rack. After capping 50 tubes in one turn, the Novitain Capcluster-50 retaining foil can be simply removed to leave each tube individually capped, in turn minimizing cross contamination. Each tube can be easily opened again using the tab attached to each cap without the need for additional tools. Compatible with automated pre-analytical systems, the lightweight 50-well Novitain Rack has an open well side design to ensure equal temperature for all sample collection tubes during cooled storage. Drawing upon proprietary Micronic technology, Novitain Push Caps offer a rapid and economical solution for capping 50 racked sample tubes using the Novitain Manual Capper CV750. The Novitain™ Capping Solution is already used by many medical laboratories worldwide. Most of these laboratories use the Novitain products in combination with automated pre-analytical systems.